Allison Wahl is customer community specialist at Brainshark, Inc., a leader in cloud-based business presentations. Brainshark’s offerings include Brainshark On-Demand — for turning static content such as PowerPoint documents into online and mobile video presentations — and SlideShark, the award-winning app for showing PowerPoints from the iPad and iPhone. Thousands of companies use Brainshark to improve the reach and results of their business communications, while dramatically reducing costs. In this conversation, Allison discusses Brainshark’s annual Sharkie Awards program, which is now accepting submissions. Geetesh: What exactly is the annual Sharkie Awards, and what have you got lined up for the upcoming 2014 program? 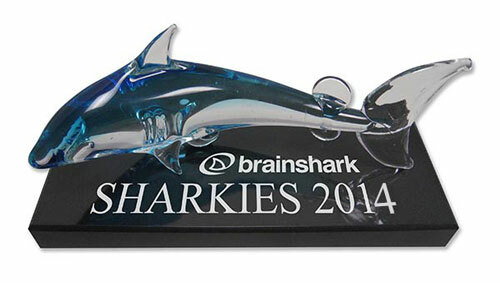 Allison: Each year, Brainshark hosts the annual Sharkie Awards, which honor and celebrate excellent presentations. This will be our sixth year hosting the program, and we’re as excited as ever to see the innovative, inspiring and creative entries. Presentations created in 2013 using Brainshark On-Demand and myBrainshark are eligible, and there is no cost to enter. The deadline for entries is January 31, 2014 — and on April 4, we’ll be announcing the winners in an exciting, online awards ceremony that we and our customers look forward to every year. The Sharkies recognizes outstanding presentations across a number of categories — including presentations used for marketing, training and charitable causes, as well as the best mobile-optimized presentation, best first-time author presentation and many more. One of our new categories this year is “Best VideoSync Presentation,” showcasing presentations that combine video and slides, side-by-side, in a powerful way. We’re also very excited that, for the first time ever, we are going to recognize the people behind the scenes of corporate Brainshark accounts with the “RockStar Company Administrator of the Year” award. Company administrators manage their company’s Brainshark site and are responsible for adding new users, running site reports, and being the liaison between a company’s authors and Brainshark. Their role is often a key determinant in their company’s success with Brainshark, and we want to highlight the work of truly stellar and exemplary individuals. Geetesh: Who can participate in these awards? How will the winners be determined and are there any prizes for the winners? Allison: As your readers may know, Brainshark makes it easy to transform static documents such as PowerPoints into dynamic, mobile-ready video presentations. You can add voice, interactivity, video clips, attachments and more to your presentations to really drive interest. Users of our enterprise products, along with users of our free myBrainshark.com site, can submit their presentations. A team of Brainshark judges will review and evaluate all presentations to determine the winners in each award category. Judges are looking for the following criteria, as appropriate to each category: a clear and concise introduction, quality of the script, length of audio per slide, the table of contents, incorporation of Brainshark features, slide visuals, use of animations, audio quality, presentation style and call to action. Each category winner will receive a coveted Sharkie Award statue, a special mention during the April awards ceremony and prominent placement in the Sharkie Winners Gallery (we encourage you to check out the great previous winners). All category winners will be also eligible to win the overall “Presentation of the Year” awards (gold, silver and bronze levels), which come with even more acclaim (and prizes)! Brainshark customers, viewers and fans help judge this portion of the competition. The gold Presentation of the Year winner will receive a grand prize (such as a trip, team outing or iPads) valued at $2,000. Second and third place finishers win prizes valued at $1,000 and $500 respectively. For those whose corporate policy precludes accepting gifts, we can make a donation to charity in their name or provide credit for Brainshark professional services. In addition, three rock star company administrators will win an all-expenses paid visit to Boston. We’re very excited to host this program again, and uncover and celebrate informative, creative and really cool presentations that are having a big impact within organizations. For more information about the awards, feel free to check out this page. Thanks for the opportunity to share these details and our enthusiasm, Geetesh! We are so thrilled to see what the sixth annual Sharkie Awards will bring.